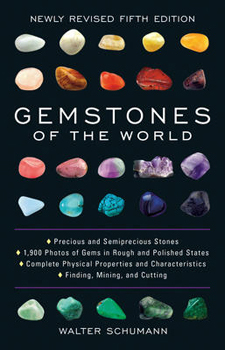 Following the spectacular success of the first four editions of Gemstones of the World, the revised fifth edition exhibits important updates and a beautiful new cover. All the gemstones ever discovered - now over 1,900 - are treated in their many variations. More than 1,500 full-color photos showcase each precious and semiprecious stone in both its rough natural state and its polished and cut renditions. Each entry offers complete information on a gemstone's formation and structure, physical properties and characteristics, methods of working, cutting, and polishing. You'll find full treatments of lesser-known gems, from andalusite to vesuvian, and a special section devoted to rocks as precious stones, including alabaster, onyx, obsidian, and fossils. Organic gem materials, such as coral, ivory, amber, and pearl, are also covered along with new-on-the-market stones like charcoite. Additionally, this all-inclusive volume includes imitations, synthetics, and combined stones. Charts and tables help you identify unknown gemstones and - when you're in the market - how to check for genuineness.